Auditions for Macbeth will be held Saturday, March 6, and Sunday, March 7, from 3 to 5 pm each day, in Uris Hall, Room 398 on the Cornell University campus (corner of Tower Road and East Avenue). Actors may come any time between 3 and 5 on either day, and are asked to prepare a 1-minute Shakespearean monologue and bring a photograph of themselves. Roles are available for all ages, including two roles for young actors (one male, one female, age 14-15 or below). We're looking for a large cast for this production, so this is a great opportunity to get involved with the ISC! The Ithaca Shakespeare Company has joined the Shakespeare Theatre Association of America, an international professional organization "for the producers of Shakespeare's plays." Member organizations are drawn from all over the world and include such institutions as Shakespeare's Globe in London, the Stratford Shakespeare Festival in Canada, and the Folger and Shakespeare Theatres in Washington, D.C.
One of the cornerstones of the ISC's approach to Shakespeare is the way we try to immerse our audiences in the world of the play. We stage our productions so that the action surrounds and envelops the viewers, and characters can be seen behaving "in character" even when they're "offstage." For this summer's production of Macbeth, we plan to take this approach even further. When the audience enters the performance site, we want them to feel like they're stepping back in time, into another world...a world of kings and queens, warlords and witches, soldiers and servants. To do this, we'll be creating several distinct environments within the performance site, each active and populated throughout the performance. Audience members will be able to walk through these areas before the show and see the characters going about their business. We want to create the feeling that this is a world where these characters live all the time, and the scenes of the play are just brief episodes in their lives that we happen to be focusing on for a short time. A sort of "living-history-meets-Shakespeare" approach. One of these environments will be the witches' grove. 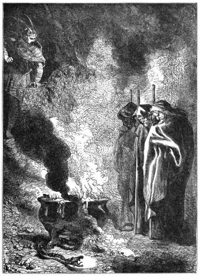 Many of the witch scenes in the play were not written by Shakespeare at all. They were taken from another play, by Thomas Middleton, and added to Macbeth by Shakespeare's acting company after he had died. They draw heavily on the conventional theatrical stereotypes of Shakespeare's time, giving us witches that are sometimes scary, sometimes silly. We want to delve a little deeper with our witches. 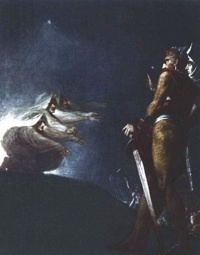 Shakespeare's historical source for the events of the play, Holinshed's Chronicles, says that the witches who appeared to Macbeth and Banquo looked like "creatures of elder world," and that many people thought they were "the goddesses of destiny." 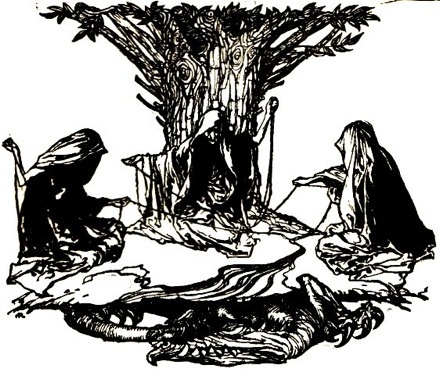 This is in keeping with the way the witches refer to themselves in their dialogue: they call themselves "the weïrd sisters," where "weïrd" comes from the Old English term wyrd, meaning "fate" or "destiny." And the primary power that the witches have in the play is indeed the ability to prophesy about what will happen in the future. 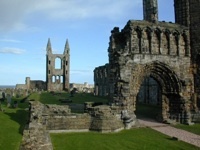 Now imagine a group of women cultivating such powers on the outskirts of society in 11th-century Scotland, the time when the historical Macbeth lived...a time when Scotland had become fully Christianized only relatively recently...might the men who held power in this society not think of such women as witches? This is the starting point for our approach to these characters. We want to create a whole community of witches, and restore to them some of the power implicit in the traditions on which they draw. So we wanted to incorporate this idea of a crumbling castle into our set design for the show, with the castle being one of the "live" environments, like the witches' camp...a world in which servants bustle and clean, people come and go, and life goes on even when it's not the focus of what's happening onstage. We're also aware of the need to make our actors more visible to everyone watching the show — especially those in the back. So for the first time, we'll be putting up a raised stage for this production. Finally, we wanted the set design to reflect some of the key patterns of imagery in the play, among which blood and serpents are very important. Set designer J.G. 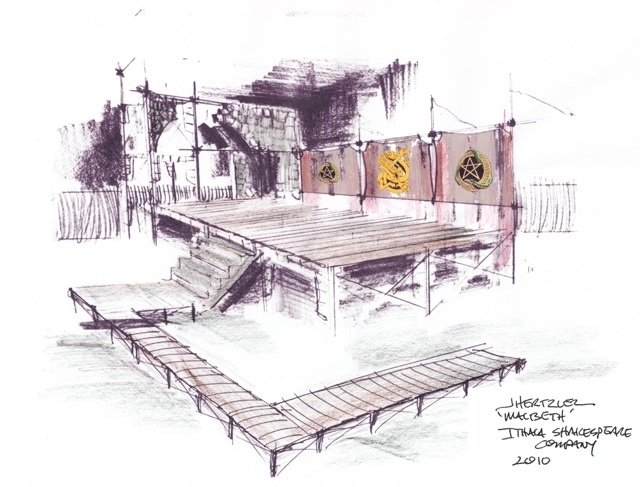 Hertzler, the director and designer of last year's production of A Midsummer Night's Dream, brought all of these elements together in a preliminary concept sketch for the Macbeth set, which you can see below. 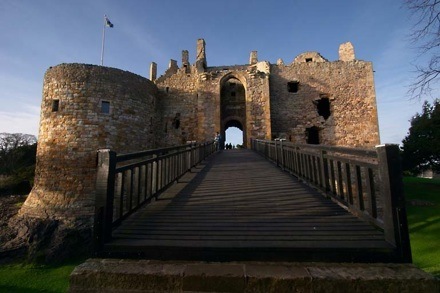 There's a ruined castle arch, a raised stage, blood-colored banners with Celtic snake symbols painted on them, and a walkway that extends out into the audience area. The set will be the focal point of the performance and ensure that everyone has a good view of the action — although, as always, we'll be making use of the entire site in one way or another.